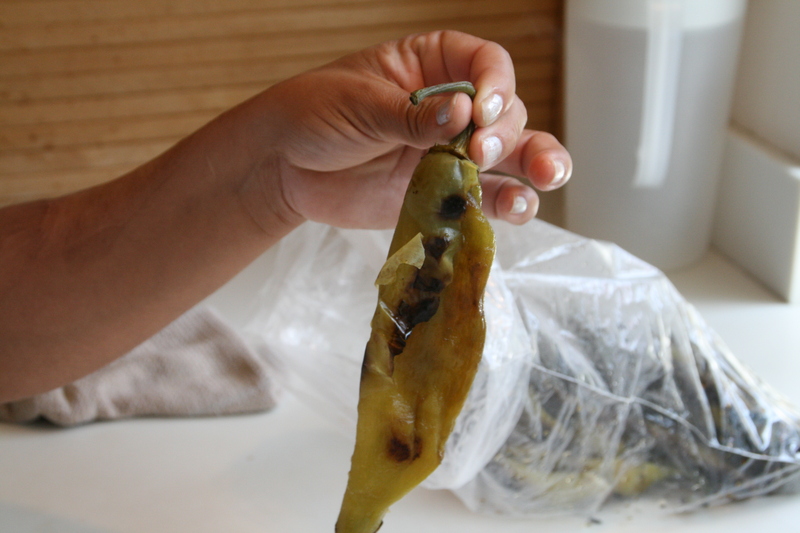 Hatch chiles from New Mexico are like a summer romance. They blow into town in August, young, delicious, fresh and sassy, and by the end of September, they’re gone with the season. If you see them at your store, buy some now! Prized for their meaty flesh, Hatch chiles are named after the original growing area in Hatch, New Mexico — the Mesilla Valley just north of Las Cruces, along the Rio Grande near where it crosses into Texas and Mexico. There, the intense sun by day and the cool nights conspire to yield a flavorful, mildly-hot chile beloved in rellenos, chile verde, soups or in anything that could use a green chile boost. Once you get them home, you must roast and skin them. 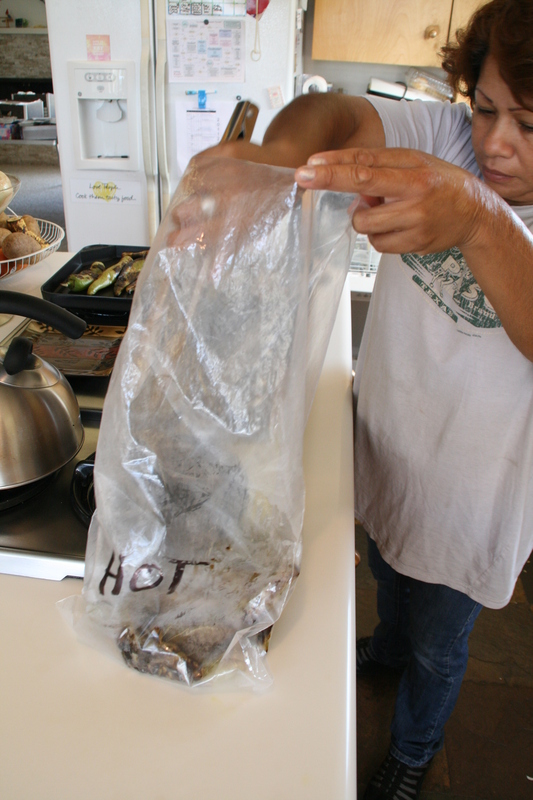 My friend Rosa showed me how she does it the easiest way possible, for today’s Shockingly Delicious Cooking Class. My box of Hatch chiles was sent to me by the wonderful folks at Melissa’s World Variety Produce . I got both hot and mild varieties. In truth, the hot version seemed fairly mild, as well, so don’t be afraid of it. 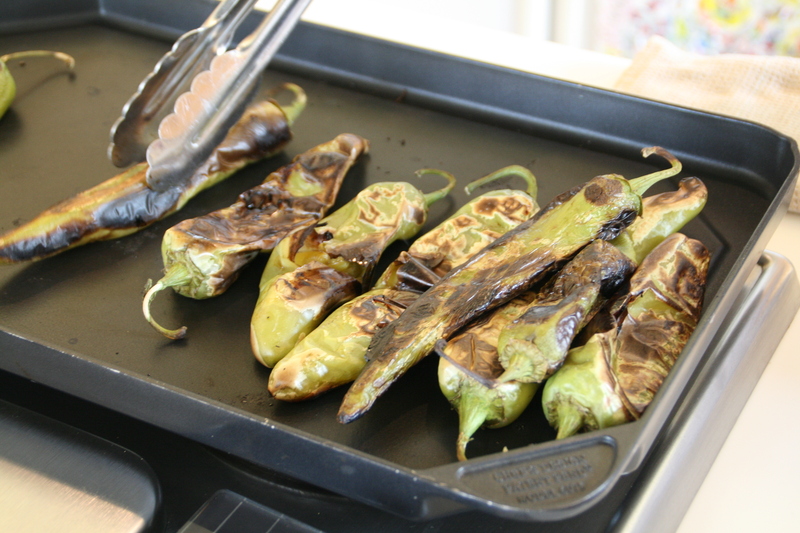 For efficiency, Rosa heats a griddle pan on the stove and lays out the chiles. 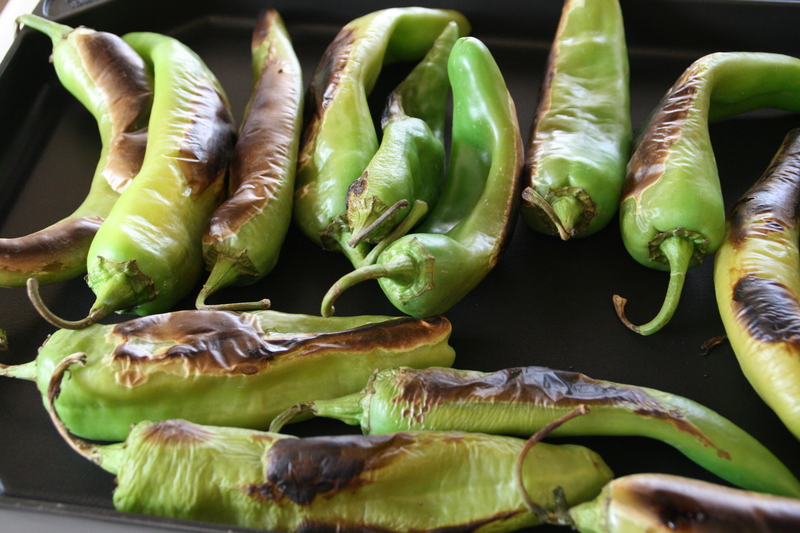 As the skin begins to sizzle, pop and brown, she turns them to roast evenly. As they roast, they might contract a bit on the side that is heating, so they curl up a bit. She grabs a wooden spoon to tamp them back down. 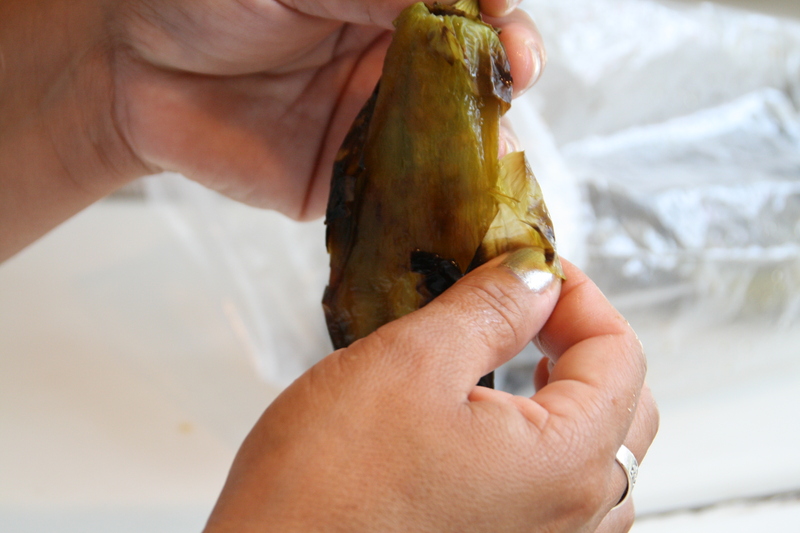 As a batch of them are done (the skin is dark and blistered), she puts them into a sturdy plastic bag. 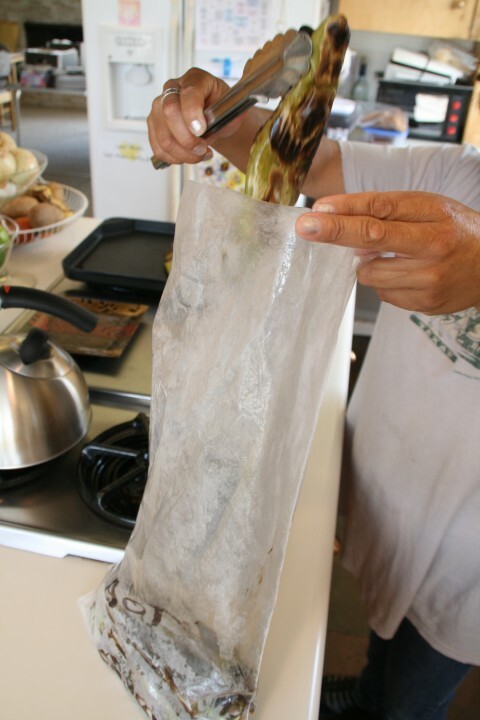 Fold the bag over and allow the chiles to steam in their own heat. 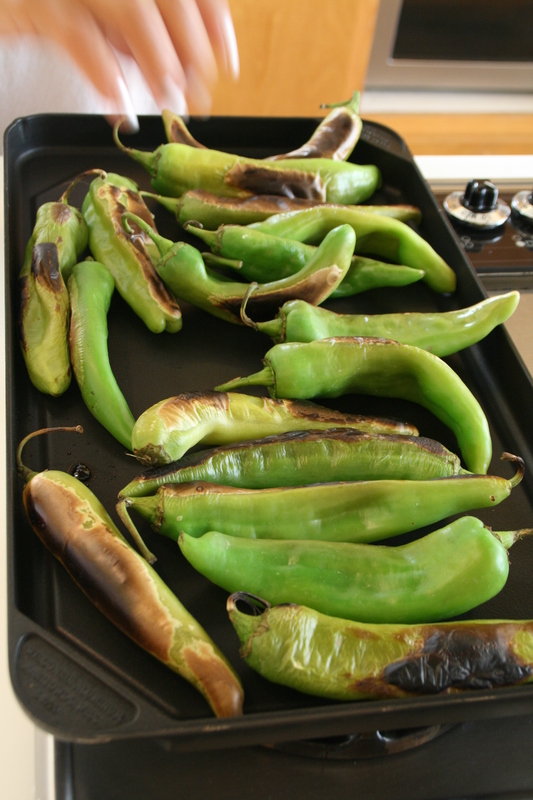 Meanwhile, there are still chiles on the griddle. 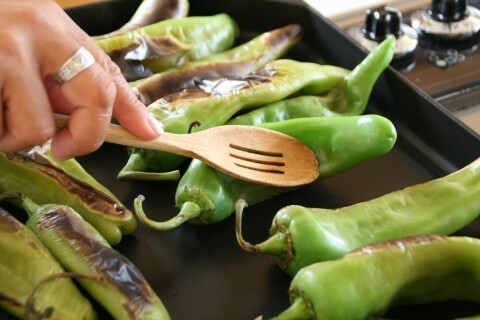 Tired of burning her fingers turning them, she grabs a metal tongs. 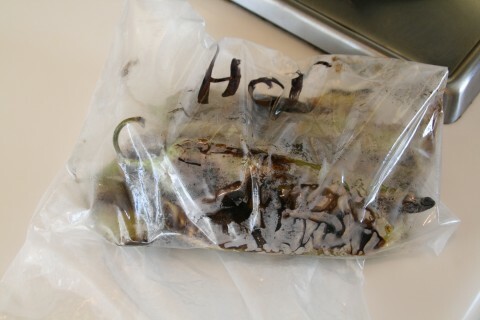 Again, as they are done, they get placed into the bag. Let them sit on the counter in the bag until they cool down. This steaming will loosen the skin. When they are cool, remove them from the bag. Gorgeous! Using your fingers, gently peel the dark, blistered skin off. It will slip off easily. It’s a bit like peeling a sunburn after a few days when it starts to flake. Voila! 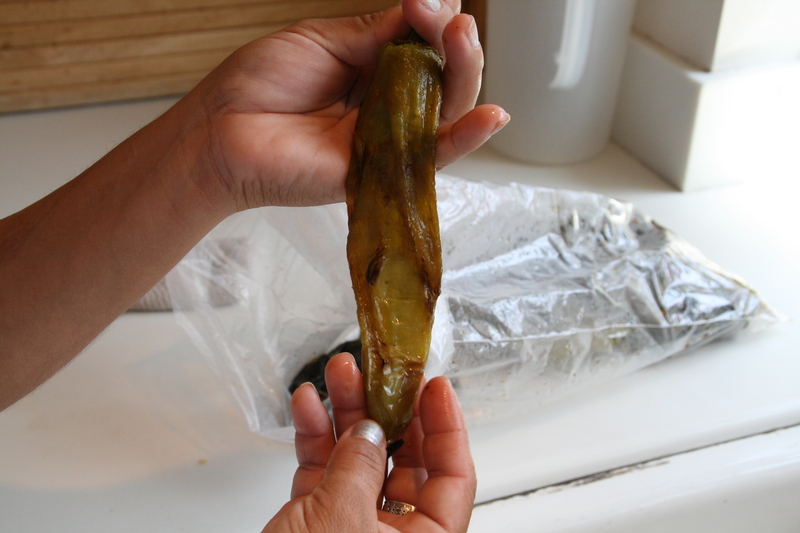 Hatch chile ready for the next step! 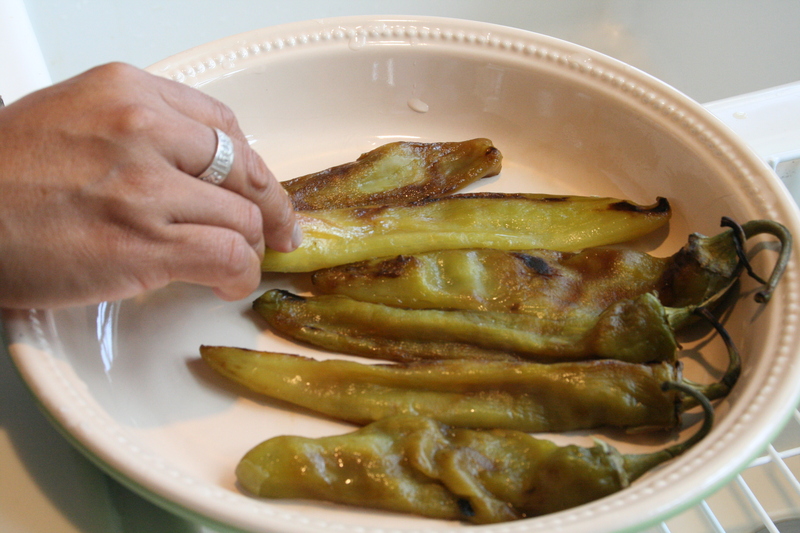 Peel them all and set in a plate. 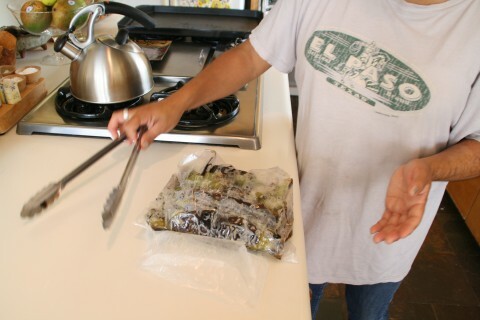 At this point, you may freeze them as is, or better yet, cut the stem off, use your finger to scoop out and discard the seeds, and chop them. Either use fairly soon, or freeze in small containers for future use. Hope you enjoy your Hatch chiles! One you get the hang of roasting, it goes very quickly. 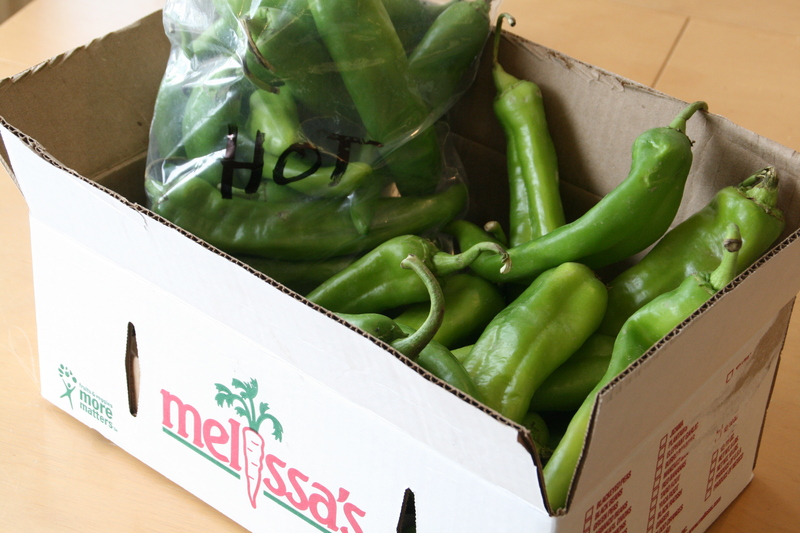 Thanks to Melissa’s World Variety Produce  for providing the box of chiles for this lesson.